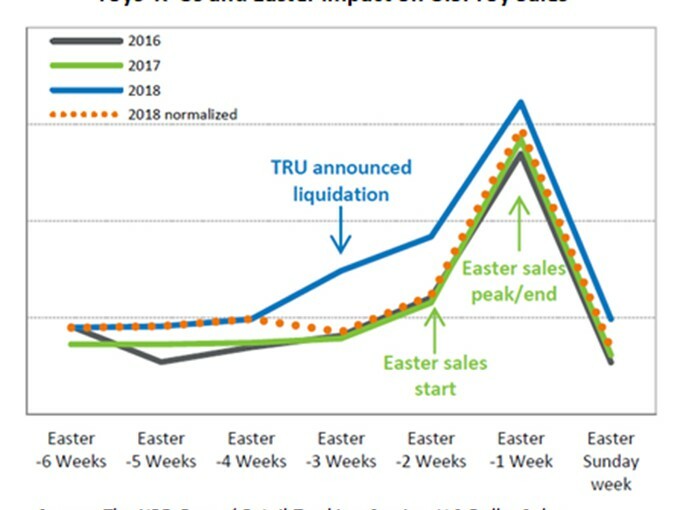 New data from The NPD Group shows that Toys "R" Us store closures and an early Easter contributed to a 13% rise in US toy sales during the first 14 weeks of 2018. While Toys “R” Us’ ongoing store liquidations have negatively impacted toymakers’ bottom lines, the US toy industry as a whole has not only been surviving—but actually thriving. 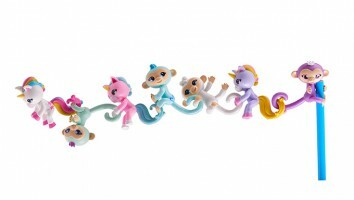 According to new data from market research firm The NPD Group, US toy sales grew by 2% in the first 10 weeks of 2018 (on par with the same period in 2017). The next four weeks, however, included the beginning of Toys “R” Us liquidations in the US (March 15) and an early Easter (April 1). NPD data shows that US toy sales between March 11 and April 7 grew by 36% compared to the same period in 2017, contributing to 13% year-to-date growth for the first 14 weeks of 2018. 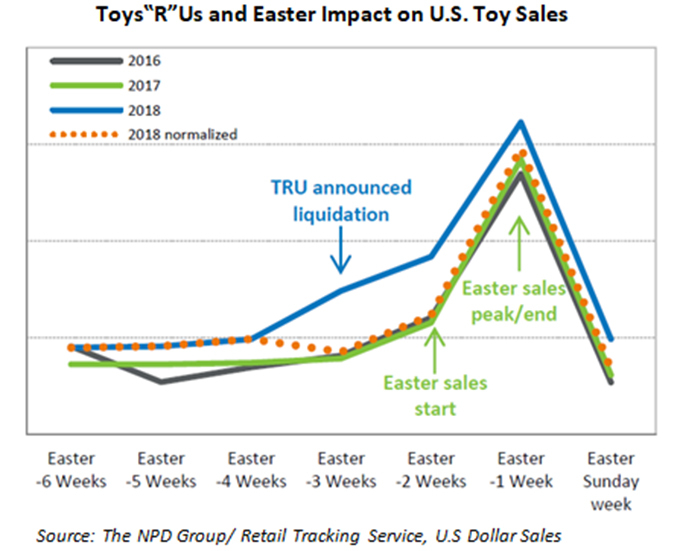 Toy sales generally experience a bump in the two weeks leading up to Easter, which led NPD to normalize the year-to-date sales trend in an effort to determine the impact of the Toys “R” Us announcement. After splitting out Easter, NPD reports that approximately US$180 million more was generated between March 11 and April 7 of this year, which can be attributed to the Toys “R” Us liquidation. NPD data shows that the fastest-growing categories in the first 14 weeks of 2018 included Youth Electronics (led by WowWee’s Fingerlings), Dolls (led by MGA Entertainment’s L.O.L. 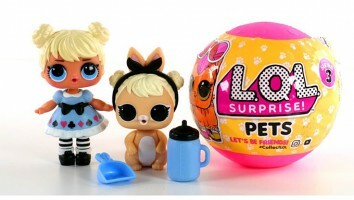 Surprise!, pictured) and All Other Toys (thanks to slow-rise ranges like Soft’n Slo Squishies, Smooshy Mushy and Squish-Dee-Lish). “The Toys ‘R’ Us bankruptcy has brought an incremental sales opportunity to the toy industry, and with at least a month to go until it wraps up, there is still more to come,” Juli Lennett, SVP and toys industry advisor for The NPD Group, said in a statement. In a poll conducted by data mining company CivicScience on behalf of NPD, 56% of US customers who purchased a toy, game or arts/crafts product for someone from Toys “R” Us or Babies “R” Us in the last month gave it to them immediately. Those who did not give the item away immediately planned to do so by June (12%), between July and September (10%) or after September (22%). Lennett anticipates that, of the 22% planning to give gifts in October of later, about half of that number is for birthdays or other occasions (with the remaining half earmarked for Christmas). This split would result in a net impact of less than 1% on future Christmas sales. Earlier this year, NPD released data that showed toy sales would not be as dramatically affected by TRU’s store closure as some believed.